Father’s Day I hope to fish with one of my most-cherished heirlooms. The old reel clanks and wobbles like a hand-cranked egg beater. The rod is so heavy the tip dips in a perpetual bow. They’re like the Beverly Hillbillies’ jalopy compared to the sleek and balanced fishing gear of today. 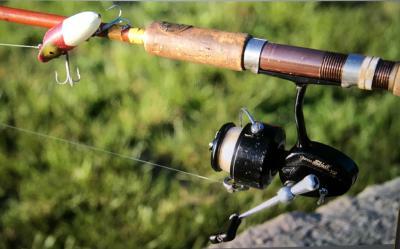 But the spinning reel and fiberglass rod were fancy stuff on Father’s Day, 1972, when my father first fished with them. They were a present from my mom, though she’d been comatose several days by the time Father’s Day arrived. Dad dutifully fished with the outfit that afternoon, knowing the 36- year-old love of his life would leave to be with the angels the next afternoon. I’m not sure Dad ever fished with the old Garcia 308 and Eagle Claw rod again. But on or around most Father’s Days I take the cherished gear bass fishing. It’s a rare link to when I was 14, and we were a complete, loving family. Fishing gear was a frequent gift to my dad when I was a child. Born in June, he repeatedly asked for things like lures or line for both his birthday and Father’s Day. Looking back, I now know most things on his wish list were to replace items I’d somehow lost. 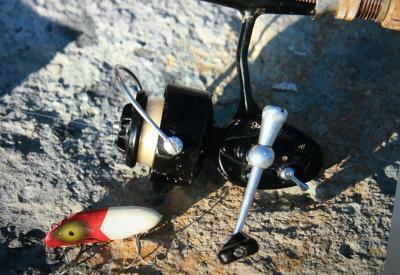 Most times I, with some monetary and often transportation assistance from my mom, gave him a gift box with things like a new spool of line for our spin-cast reels, packages of swivels, maybe a Jitterbug , Mepp’s spinners or those old Crème plastic worms that looked as life-like as a pencil. Literally from when I could walk I’d been addicted to angling. Like today’s kids my right thumb was my dominant digit. But rather than from a cell phone, it was from pushing the line release button on the back of spin-cast reels. I probably caught more fish a year than any kid in Tonganoxie, and I also lost more gear. Some shoreline willows along favored lakes or ponds had more sparkle and shine from my lost lures than a nicely decorated Christmas Eve evergreen. Many were midge-orenos, my dad’s favorite lure. The heavy, and often out of balance floating/diving lures, sometimes seemed to fly with a mind of their own on long casts. It would have been easier to shake a squirrel out of a treetop than one of those lures, with its two big treble hooks. Dad liked throwing the heavy lures for big bass so I’m not sure how I came up with idea that Dad needed a whimsy ultralight spinning outfit for that Father’s Day. He had little interest in bluegill or crappie and we rarely fished for trout. There was probably an article touting ultra-lights in Outdoor Life, or some other fishing magazine I’d read cover to cover at the barber shop. There may have been something on Harold Ensley’s television show. When I priced the combined rod and reel at around $30, I figured he’d end up getting an assorted gift box again. Mom was justifiably tight with money, mainly because we never had much of it. Most times $10 was around the maximum for Dad’s gifts. Looking back, she’d gotten terribly ill, with horrendous headaches, several times that spring. Doctors were stumped. I’ve often wondered if she somehow sensed her time was short, and splurged on the last gift she’d give her husband. Maybe it was more of a gift to me, hoping to enjoy my excitement while she could. Wrapping the rod and reel was probably the last thing Mom and I ever did together, just the two of us. Several days prior to Father’s Day she’d been taken to a Leavenworth hospital for testing. She was on an x-ray table when she turned to a nurse and asked for her husband to come immediately. Mom held it together until Dad arrived, squeezed his hand, professed her loved for us both and faded into a coma. Doctors later blamed an aneurism. Mom was on life support a few days but doctors said it was only postponing the obvious and inevitable. I gave the wrapped rod and reel to Dad from both of us on Father’s Day morning. Somehow he buckled it up and we went fishing at a relative’s pond that afternoon, before we headed to the hospital. I wasn’t allowed to be there the next day when the respirator went silent and Mom died. Because I was an only child, we fished even more than usual that tough, lonely summer of mourning. It was back when males weren’t supposed to seek help, especially for emotional issues. Quiet times on private waters was the best therapy we found. Day after day with faithful young friends I fished the afternoons. So many evenings Dad and I hauled a small johnboat with the hardest seats in the world to one of many ponds. I fished the ultra-light outfit Mom and I had given Dad most of those times that summer. By the next spring a similar spinning outfit somehow appeared as a gift to me from Dad. The one Mom bought him disappeared. My kids were already born when dad walked from his garage and handed me the familiar-looking old ultra-light rod and reel many years later. “Do you know what this is,” he asked. When I answered it was his final Father’s Day gift from mom, dad said he wanted me to take it home. A few years later, when Dad was on Hospice care because of cancer, he softly asked, “Do you still have the…?” He smiled when I said it was cherished and in a safe place. For many years it was in a prominent place in a rod rack, a reminder of the saddest time of my life. But as they say, time heals such wounds. Probably ten years ago it caught my eye and it felt good in my hand again. As I spun the clanking old reel’s handle and shook the willowy rod, happy memories came. I took it fishing near Newton that Father’s Day, with some of Dad’s old midge-orenos I had on display in our house. They even had a few scratches in the paint from where Dad had bounced them off rocks or logs casting towards shore decades before. My first cast with the old gear in more than 20 years caught a nice largemouth. It made me smile. A few weeks ago I added new monofilament to the reel’s spool. 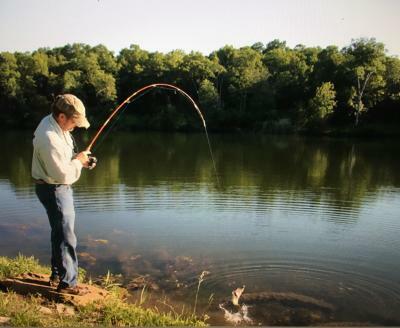 At a good bass pond I’ll use that over-matched rod and cast those heavy lures that will sail off like knuckleballs from a cannon. Sooner or later I’ll lose one of those lures high in a tree. It’ll be just like old, happy times.